A Union Pacific “Stacktrain” passes the Santiam Road crossing in Albany on July 25. 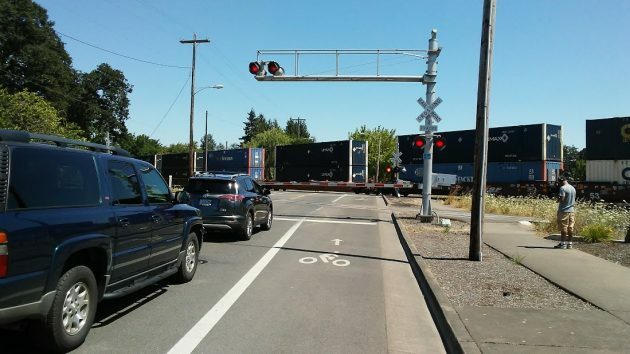 Here’s another reason to welcome double-stacking of containers on Union Pacific’s mainline through Albany: Think of the additional congestion prevented on Interstate 5 that the trains represent. As frequent freeway travelers know, traffic is getting heavier all the time, and not just in summer when swarms of tourists towing RVs add to the load. And think of how much worse conditions on I-5 would be if the freight carried by the UP had to be transported on trucks instead. I snapped this photo about two weeks ago while stopped, on my bike, at the crossing on Santiam Road. The frame shows 12 40-foot containers. I didn’t count all the cars, but I would guess the train was at least 10 times as long as the segment shown in this frame. That would make about 120 containers speeding their way south. If there are 10 trains like this per day, we’re talking about a volume of freight that would otherwise go on 1,200 trucks. As it is, long lines of 18-wheelers rumble up and down the freeway these days. Add another thousand or two every day, and you can imagine the effect on other traffic. Driverless trucks will greatly mitigate the problem since they won’t feel compelled to pass another truck going 0.4 mph slower than them on an uphill grade. Those headless trucks are coming, make no mistake about it. Too much cost-savings to ignore! As various studies (according to a Google search) show that upwards of 80% of accidents are caused by human errors, driverless vehicles will eventually lead to fewer accidents, safer roads, and a decrease in death and injuries, as well as property damage. Computers do not get bored or distracted and are very good at staying on task. However, this may very well not lead to decreased passing by trucks. That is, an ideal algorithm will optimize for fuel efficiency and delivery time, as well as speed limits and road conditions. Thus the optimal speed willl vary from vehicle to vehicle, and could as likely increase rather than decreased passing. There are too many unknowns to predict this. Next up: Pilotless planes. Look out!